There's not much that we're certain of about Saint Valentine, but he might have been a bishop and he is often depicted that way. 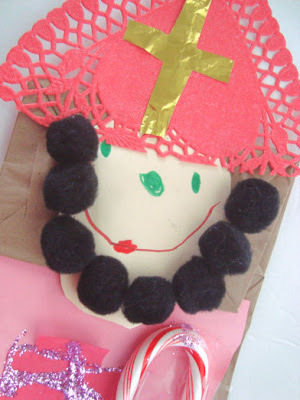 Since making the nun craft from yesterday, I've been obsessed with paper bag puppets! They are so much fun and my kids love them! 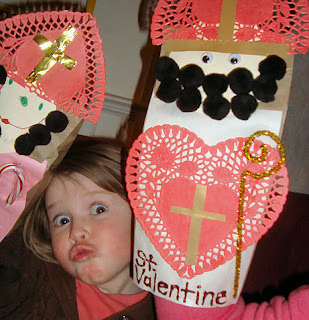 So... we made St. Valentine! To make your own, start with a paper bag. The head and clothes are cut from colored paper. Add googly eyes, and a pom pom ball beard. I didn't use cotton balls because I didn't want him to look like St. Nicholas. I made his bishop's hat out of a heart shaped doily with the top cut off, and embellished it with some gold colored paper. 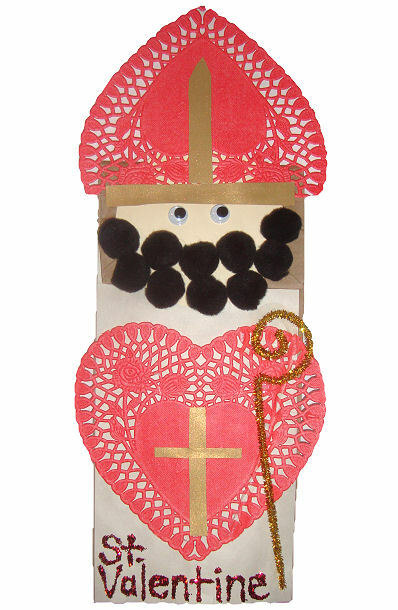 I used another heart shaped doily on his body, and added a pipe cleaner for his bishop's staff. 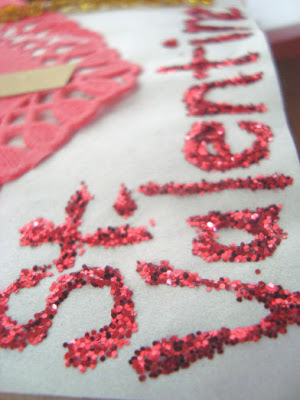 "St. Valentine" was written with glue and then sprinkled with red glitter. 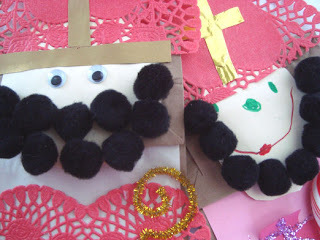 (See the nun puppets for a picture of an unassembled saint puppet.). She really wanted her bishop's staff to be a candy cane (guess all that drilling it into her head at Christmas that a candy cane is a shepherd's staff really stuck) but it wouldn't stick with glue so we had to tape it on. I wish I had a St. Valentine holy card to glue in the middle of the heart. I think that would be really cute! A prayer of St. Valentine would be equally awesome, but my printer is out of commission right now. :-/ I hope you guys are enjoying these paper bag saint puppets as much as we are! Think about the All Saints Day parade you could have with these puppets! I was trying to brainstorm a valentine's day project that would actually incorporate something about the saint, rather than just hearts and cupids and the usual commercial stuff. You have a great idea here. Might make a series of puppets to use with Robert Sabuda's book on Saint Valentine. Thank you for sharing your creativity! 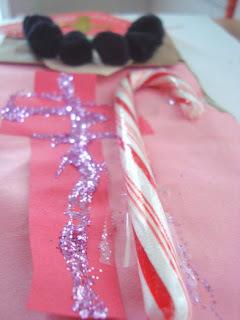 Every time I visit your blog, Lacy, I'm taken back to those precious years when our boys were little and loved to craft. We spent sooooo many hours at the kitchen table. My 15 year old just mentioned it again yesterday. I LOVE this puppet. I hope lots of moms will embark on crafting at the kitchen table and make lots of gorgeous valentines and teach their kids about this saint. Your blog is a terrific resource! Moms: The toddler, preschool, and school-age years are so valuable! Use them well. You will never regret it!! Thanks for all the great ideas and for bringing back such great memories to this mom of teenagers! P.S. One year, we made your decoder valentine and sent it to our children's great-grandmother, who was an artist who treasured creative and new ideas. She LOVED it!! Years ago, I heard a radioshow about St.Valentine. They said that he had been the gardener in his convent in Italy, if I remeber correctly, and that he gave out roses to random people, just to make them happy. I guess 95 % of this is myth, but that´s the case with a lot of those things, isn´t it? I always thought it was a nice story, so, maybe you could let him hold a rose?